[Dave Birch] There was a terrific (though I say so myself) lunchtime roundtable organised by the Centre for the Study of Financial Innovation (CSFI). They asked me to set something up around virtual worlds, so I asked Richard Bartle and Aleks Krotoski to come and present to the assembled bankers. 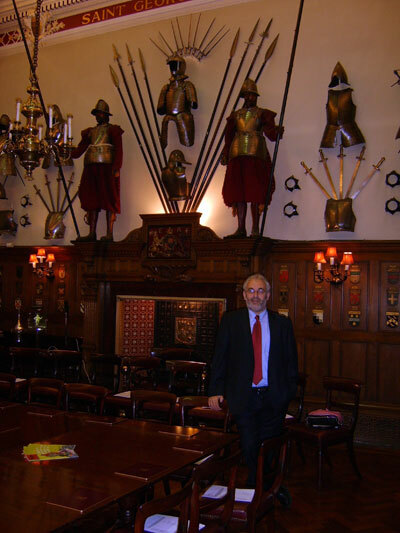 The round table was held in the Armourers’ Hall, just off of Moorgate. I thoroughly enjoyed talking about the trade in virtual swords and armour whilst sitting underneath a display of real swords and armour. Wonderful. Obviously, given the audience, there was a lot of talk of virtual property and secondary markets and other such sensible things. But I did get to talk about This Spartan Life and Red vs. Blue as well! I have to say that I also enjoyed the whole spectacle of people discussing World of Warcraft spot and future gold markets in front of both the Financial Services Authority and the Bank of England! So what did Richard and Aleks have to say, Dave? Dave Birch at the Digital Money Forum recently invited Richard Bartle and Aleks Krotoski to speak to the Centre for the Study of Financial Innovation. By CSFI roundtable standards the attendees were fairly diverse but, on a show of hands, very few had first hand experience of online worlds. Aleks talked about [virtual world] Second Life and how relationships were built on trust that could only be earned from others in the community. The chair pressed the speakers to focus on how MMORPGs would impact financial services, but seemed frustrated by their response though Dave mentioned Wells Fargo a couple of times. My take was that the event highlighted the gap between the financial ‘establishment’ and the emerging generation of consumers and entrepreneurs. To that extent, it illustrated the seismic changes in expectations that the speakers alluded to. I think there were two lines of thinking emerging: the use of virtual worlds for customer education (which I hadn’t really thought about before) and perhaps customer acquisition, and the possibility of new kinds of enterprises emerging. I thought that was something worth exploring more. As for “conventional” financial services — such as lending and payments — it was hard to come up with useful examples to discuss. But that’s why they wanted to have a roundtable! In case anyone is interested, I’m involved in another CSFI roundtable on the future of retail payments on 12th June in London. There may be some places left if you check on their website.